I’ve received a lot of questions about kitten milestones recently. I know there is a lot to say about kitten care, but I wanted to share a super simple post for quick reference. Starting at 3 weeks old, kittens start to walk away from their sleeping area to pee or poo. This is when I introduce a little litter box. Something low and shallow for them to climb into. Make sure to use non-clumping litter because kittens can get curious and eat the litter. My kitten litter of choice is feline pine. Make sure to keep the space they have access to limited (small bathroom, pet playpen, etc.) As they master the litter box, increase the space they have access to. At 3.5-4 weeks old I introduce wet kitten food. Wipe a tiny bit on the roof of their mouth and they’ll be more likely to start eating it. They’ll still need formula (if they are bottle feeding) or will still be nursing from their mother. This provide the hydration they need. 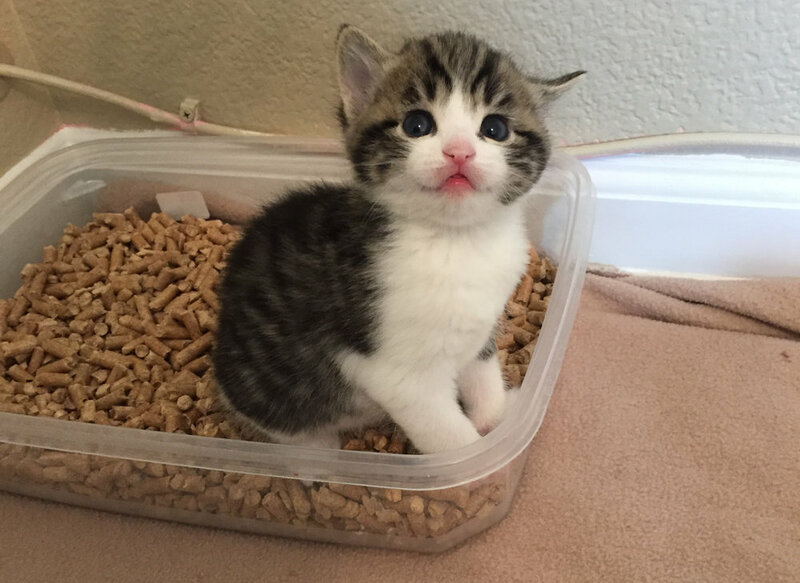 At 5 weeks old I put a TINY bowl of kitten kibble out. I say tiny because more than once my foster kittens have mistaken a bowl of kibble for a litter box. They’ll get curious and usually start crunching kibble on their own. You can also mix a little kibble in with the wet kitten food. It will help fill them up and keep them fuller longer. At 6 weeks old I put a bowl of water out. Kittens will start lapping from a bowl at this age. Once they’re eating on their own and lapping water from a bowl, the bottle is not necessary and kittens who are nursing from their mother should begin to wean. Also at 6 weeks old they should receive their first set of vaccines. At 8-10 weeks old (2 pounds) it is time for spay/neuter and they’ll be ready for adoption!